Happy Friday guys! 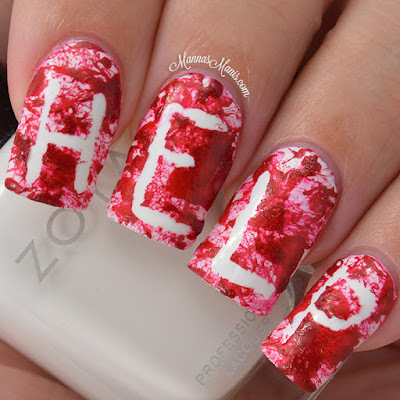 Halloween is fast approaching and I decided to do my take on a blood splatter mani. I also did a step by step tutorial if you all want to attempt this look too. It's pretty each, check it out! 1. Start with a base color of your choice. 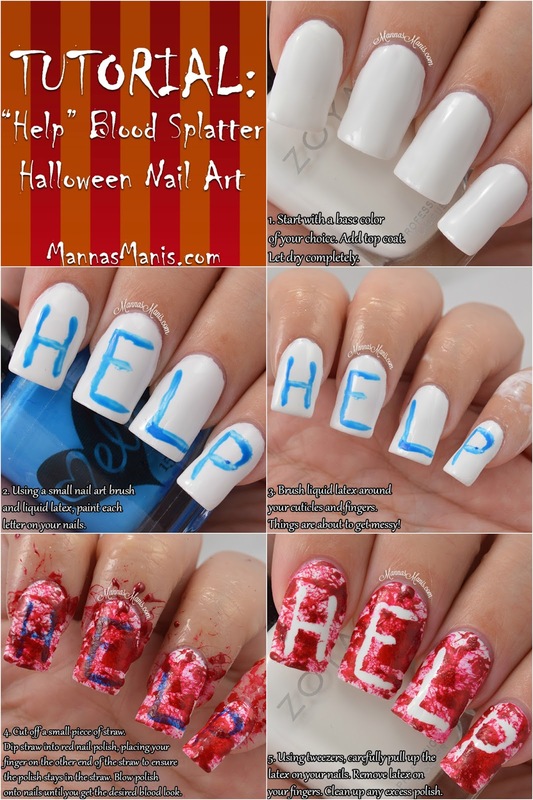 White polish would probably be best, as it shows the blood splatter the best. Top coat and let it dry completely, at least 1 hour. 2. Using a small nail art brush, dip it into liquid latex and paint each letter onto your nails. 3. Apply liquid latex all around your cuticles and as far up your fingers as possible. Things are going to get very messy with the blood splatter. 4. Using a 1-2 inch piece of straw (I suggest a straw with a smaller opening) dip it into red nail polish, be sure to place your finger on the opposite end to ensure the polish stays in the straw. Place about 2-3 inches from your nail and blow into the straw to create a bloody splatter effect. Keep doing this until it looks like the HELP liquid latex is saturated. 5. 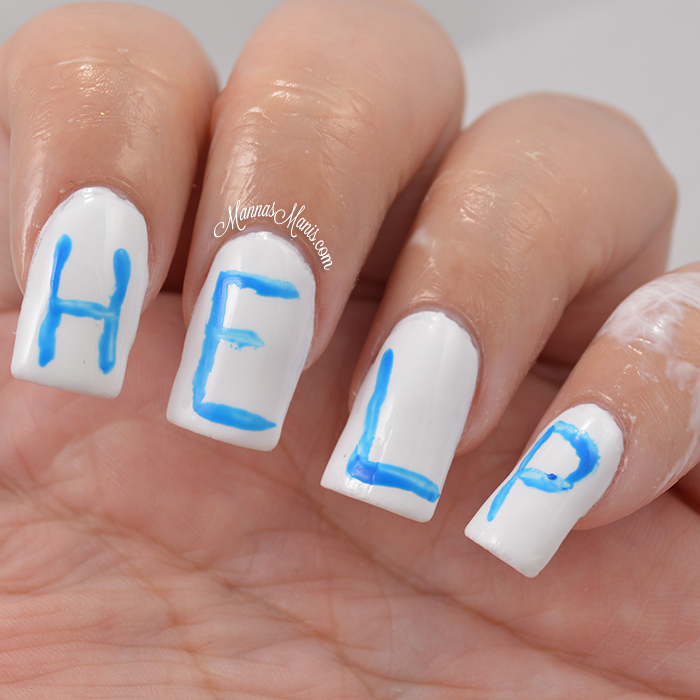 Using tweezers, slowly and carefully pull up the latex on your nails. I suggest pulling up each end before removing it as opposed to one big ripping off of the latex. Clean up any excess mess. I chose not to top coat because I liked the look of it without top coat! 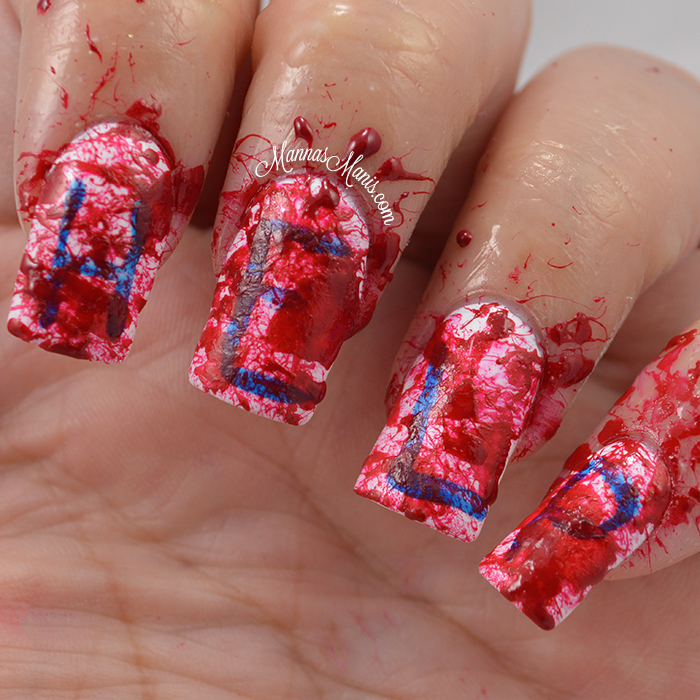 Have you done a blood splatter mani for Halloween?